Hi friends...I am back with a traditional fish fry recipe. 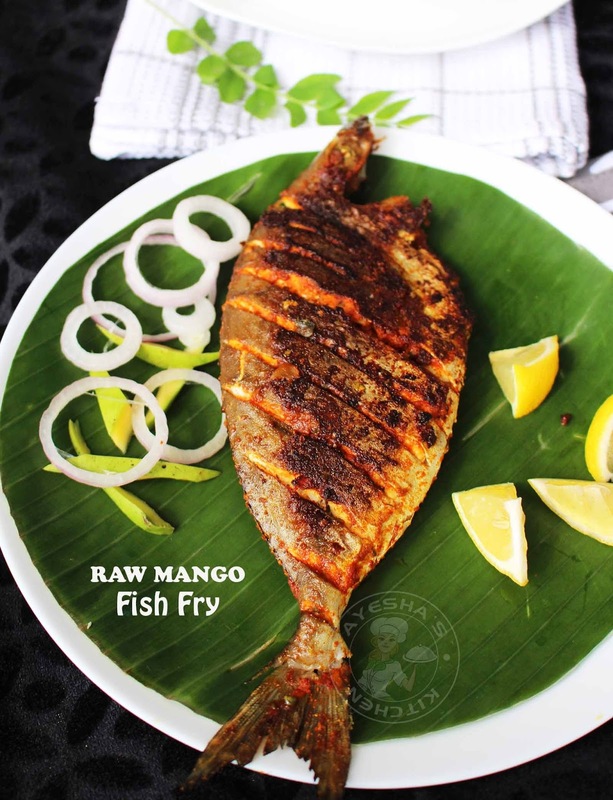 Yes, this is a Kerala style raw mango fish fry recipe. 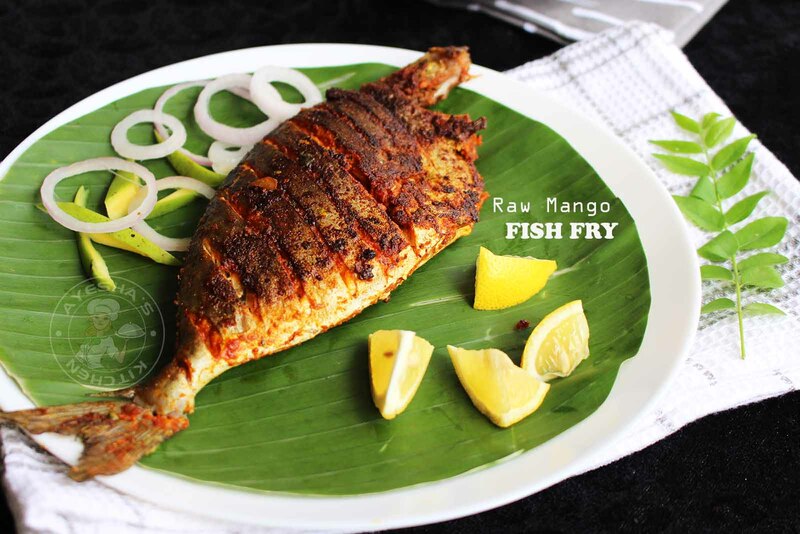 Raw mango and green peppercorns are the main ingredients which make this fish fry very special. Lunch meal without a fish fry is unimaginable for most of the Keralites. Here, fish is considered as the staple food. Fish recipes like fish curry, fish fry, fish roast, meen peera, fish pollichathu, meen vattichathu, fish stew, fish mappas, meen varutharacha curry, etc., will be common in every household in Kerala for their lunch meals. All those recipes taste different from households to households. So, today I am with a fish fry recipe with crushed raw mango and green pepper corns. Pachamanga (green mango) and pacha kurumulaku (green pepper corns) are very common in most of the kerala recipes. Though this recipe has a traditional touch, I made my own changes to suit my taste. 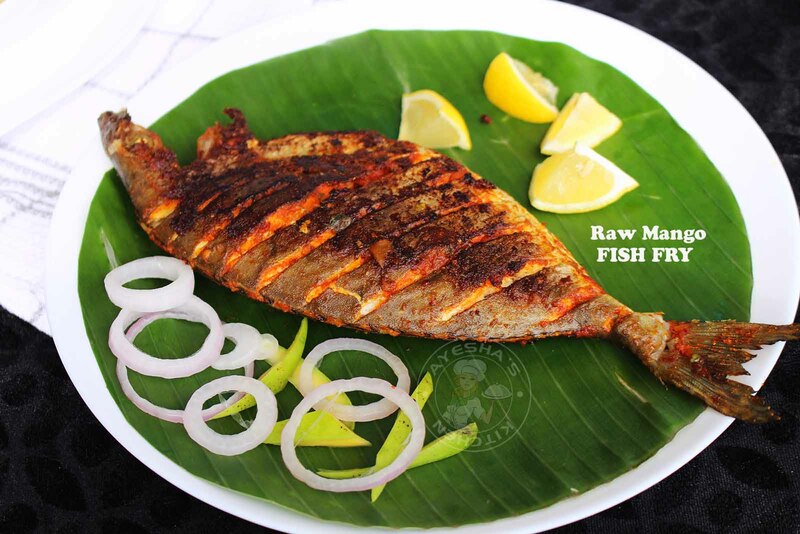 So let's move on to the recipe showing how to make raw mango fish fry/pacha manga pachakurumulaku ittu meen varuthath / nadan meen porichath / kerala style fish fry recipe. Clean the fish well and set aside to drain. Make slits all over he body. ( As I am using safi fish I prefer washing this fish in vinegar so that you can get rid of that fishy smell ). Set aside all the spice powders ready. Crush together raw mango and green peppercorns using a mortar and pestle. Combine this along with chili powder, turmeric powder, coriander powder, lemon juice, salt and coconut oil (1 tbsp). Make a thick fish marinade. Marinate the fish with this marinade and keep refrigerated for 15 minutes or more. Then heat a pan with coconut oil for shallow frying ( do not fry the fish in more oil ). When the oil is hot, place the marinated fish, sprinkle some chopped raw mango over it, fry until both sides turn golden. Flip only when one side is done.